Currently viewing the category: "Open Workshops"
April Open Workshops are in Bloom! Come to this workshop and learn more about how Mendeley combines both cloud-based and desktop computing to give you the best of both worlds! We’ll identify types of research questions and literature searches where identifying related patents can be helpful. Then we’ll cover tips and tricks for finding and reading patents. 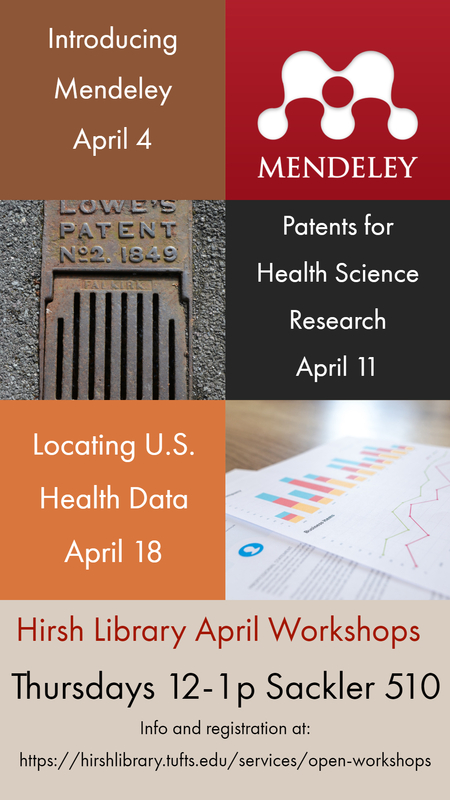 This workshop will introduce you to major sources of health data for the United States. 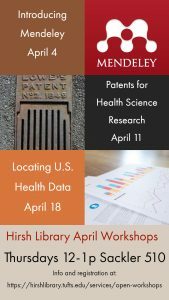 Topics will include: data collection, stakeholders, and methods, tips & tricks for locating health data, and an introduction to the Hirsh Library “Health Data and Statistics” guide. March Open Workshops are Here! March is here – time to spring into learning with Open Workshops! R is an open source programming language used to manipulate, analyze, and visualize data. Researchers and health professionals can use it to convey complex information in a manner that is easy to understand. The flexibility of R allows large amounts of data to be processed and represented in ways that spreadsheet programs cannot. This introductory, hands-on workshop provides a brief overview of how R works and what it is capable of. No prior experience with R or programming languages is required. R is an open source programming language used to manipulate, analyze, and visualize data. In this hands-on workshop, users will be introduced to R packages used for data visualization. This session includes data visualization exercises utilizing a sample data set. Prior experience with R or completion of the Hirsh Library’s “Introduction to “R” open workshop is recommended. Come to this workshop to learn about systematic reviews, meta-analyses, and other types of high-level research reviews. We will discuss topics such as the elements of a systematic review, protocols, resources, timelines, and suggested databases. Winter Open Workshops are Here! Brrrr! It’s freezing outside! Stay inside and learn! Now is the time to go deeper, learn new skills or enhance your current skills with advanced workshops. In this introductory workshop, we will review PubMed and its contents. We will discuss planning and executing a search strategy, narrowing search results, finding full-text, and exporting results to a citation management program. This one-hour session explores more advanced features of PubMed. During this session we will discuss how to search within selected field, creating a “MyNCBI” to save search strategies and receive alerts when new articles are available on a topic, as well a show to leverage the Web of Science database to add value to your PubMed search results. In this workshop, you will learn how to approach the literature review. Topics covered include: identifying key stakeholders, database selection, determining search terms, and creating effective search strategies. In Part 2, we will discuss organizing and exploring your search results, including the use of citation managers, creating evidence tracking logs, and how to describe your research process to create a “Methods” section of your project. This one-hour session will introduce you to the basics of using the citation management program EndNote. EndNote allows you to create a library of references, attach and read PDFs, and generate in-text citations and bibliographies in Word documents. This session is for beginners – no previous experience required! This one-hour session explores more advanced features of EndNote. During this session we will discuss using EndNote to create figures with captions, how to find updated citation information for records already in EndNote, how to modify output styles and much more. In case you haven’t heard, we have a new addition to our Open Workshops! 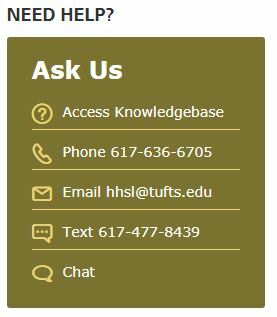 In addition to workshops, Hirsh Library and the Tufts Data Lab Assistants are offering topic-specific drop-in sessions and office hours so that you can ask questions and get one-on-one help. You don’t need to have attended a workshop or registered in advance in to attend drop-in sessions and office hours – just come and drop-in! We look forward to meeting with you! October Learning Opportunities @ Hirsh! Scared of stats? Spooked by lit reviews? Frightened by citation management? October doesn’t have to be a scary month with October Learning Opportunities@Hirsh! The Hirsh Library and Tufts DataLab have a frightfully awesome line-up of learning opportunities for October filled with tips & treats! Spring into Learning! March Open Workshops are Here! March is here, time to shake off winter and put a spring in your step! 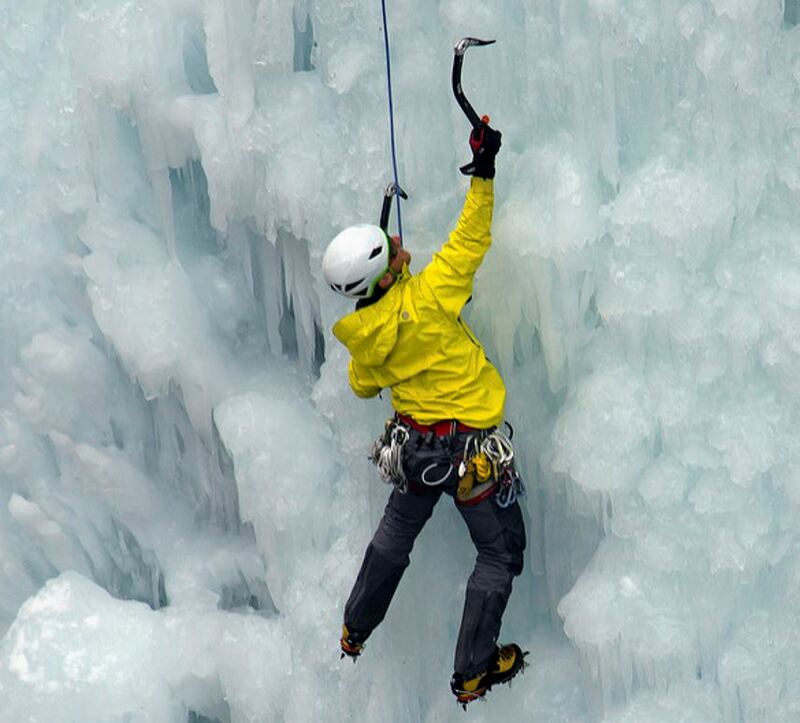 What better way to start the spring than by learning something new? Come to one (or more!) of this month’s Open Workshops for a fresh start! 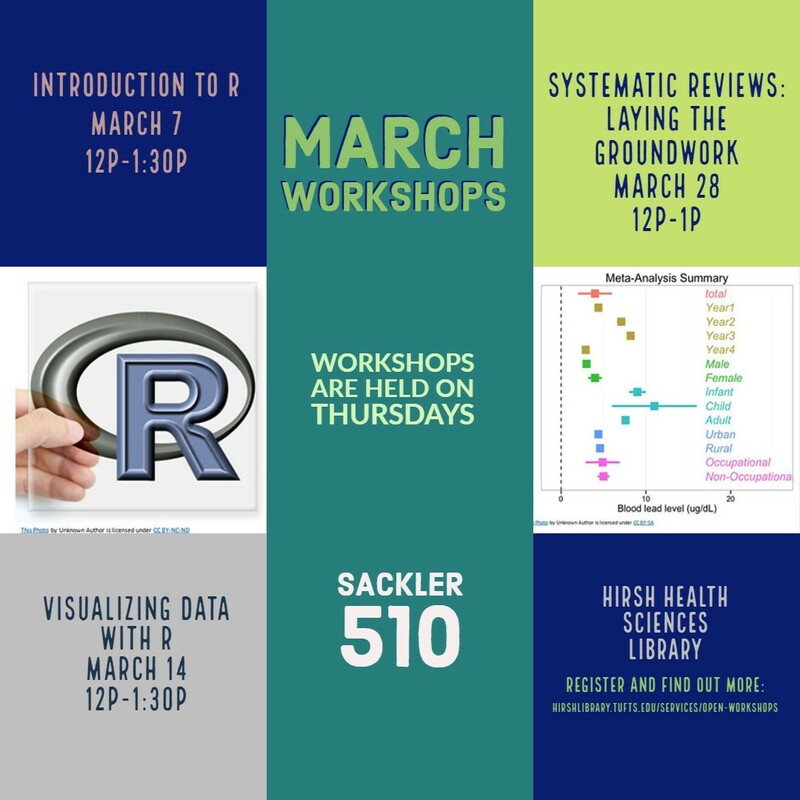 Workshops will be held in Sackler 510 on Tuesdays from 9-10am and repeated on Wednesdays from 3-4pm (unless otherwise noted). Please note that Open Workshops will not be held on March 20, 21 (Spring Break week). In this workshop, we will show you how to find the number of times an article has been cited, create a citation report for a set of articles or an author, and compare citation statistics for authors, journals or articles in a particular field. We will also discuss emerging metrics (‘altmetrics’), such as the number of times an article has been viewed or downloaded. Finally, we will show you how to choose the right journal for your manuscript. Ready to move beyond PubMed? This workshop will show you Embase, a biomedical database containing over 30 million records including articles from more than 8,500 journals published world-wide; it is especially strong in its coverage of drug and pharmaceutical research, pharmacology and toxicology. Embase is an essential database for literature reviews and contains citations not indexed in MEDLINE. Come to this workshop and see what you’ve been missing! This one-hour session will introduce you to the basics of using the EndNote citation management program. EndNote allows you to create a personal database of references and generate in-text citations and bibliographies in a variety of citation styles. This session is for absolute beginners – no previous experience is required! February is Research Project Boot Camp Month! Currently working on a thesis/Capstone/ALE or other research project? Want to jump start your project? Then Research Project Boot Camp Month is for you! 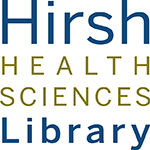 During the month of February, Hirsh Library will be offering a 5-workshop ‘boot camp’ for students undertaking research projects. Workshops are held on Tuesday 9-10am and then repeated on Wednesdays 3-4pm (unless otherwise noted). Workshops are held in Sackler 510. Please select the “Register” link if you would like to attend the workshop remotely via WebEx. In this workshop, students will learn how to approach the literature review. Topics covered include database selection, devising effective search techniques, limiting articles to relevant study-types, and tools for keeping track of results. Which Citation Manager Should I Choose? This workshop will provide a “lay of the land” regarding citation managers, such as EndNote, Zotero, Mendeley, RefWorks, and others. We will discuss how to select the citation manager that is just right for your project. This workshop will review how to identify and locate resources for your research topic. We will discuss how to identify key stakeholders, how to locate article database by topic, ‘grey literature’ and ‘trade literature’ and how to find it. Various aspects of creating your thesis or dissertation may involve copyright. Whether you are incorporating other people’s content, such as graphs or images, reusing some of your own work, publishing all or part of your thesis content, there are copyright considerations that can seem challenging and daunting to address. This workshop will provide guidance in navigating the questions and decisions that come up during the thesis and dissertation process around your rights and the rights of others. New Year, New Skills! January Open Workshops are Here! Resolve to learn something new this year and attend an Open Workshop! 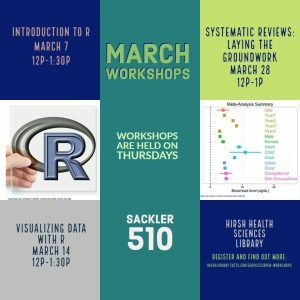 We kick off a new semester of Hirsh Open Workshops with a two part workshop on R, an open source programming language used to manipulate, analyze, and visualize data. Description: R is an open source programming language used to manipulate, analyze, and visualize data. Researchers and health professionals can use it to convey complex information in a manner that is easy to understand. The flexibility of R allows large amounts of data to be processed and represented in ways that spreadsheet programs cannot. This introductory, hands-on workshop provides a brief overview of how R works and what it is capable of. No prior experience with R or programming languages is required. Description: In this hands-on workshop, users will be introduced to R packages used for data visualization. This session includes data visualization exercises utilizing a sample data set. Prior experience with R or completion of the Hirsh Library’s “Introduction to “R” open workshop is recommended. Tips & Tricks! October Open Workshops are here! This month’s Open Workshops are sure to provide you with trove of tips and treats! 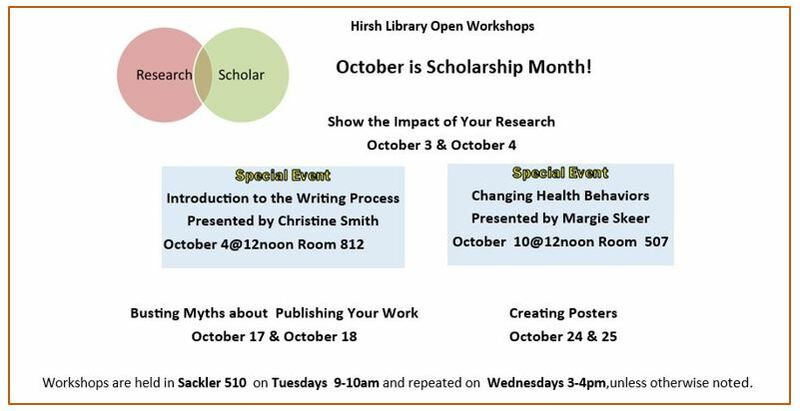 The theme of October’s Open Workshops is “Scholarship Month” and workshops will focus on the skills you need to accelerate your research and share your scholarship. See our Open Workshops page for more information, including complete workshop descriptions and schedules. Want to know how to get credit for and demonstrate the impact of your research? This workshop is for you! We will discuss how author identifiers, such as ORCID iDs, can connect you to your publications, other research products, and grants. We will show you how to find the number of times an article has been cited, create a citation report for a set of articles or an author, and compare citation statistics for authors, journals or articles in a particular field. We will also discuss emerging metrics (‘altmetrics’), such as the number of times an article has been viewed or downloaded. Like bigfoot and unicorns, some truths of publishing your work can seem a real mystery. We’ll separate fact from fiction and get to the heart of some widely-shared rumors related to your rights as an author and open access publishing. In this 1 hour workshop, we’ll be using InDesign to create a poster, while providing an overview of other print design software. We’ll also share the importance of visual story telling, using design elements to tell your story, and provide the tips on print settings and resources on campus to get your poster printed. No prior experience with InDesign is needed! And don’t forget about our Workshops on Demand. If you and your colleagues are interested in a workshop, but cannot attend due to a conflicting schedule, you can now request a Workshop on Demand: just let us know what your group is interested in, and we’ll create a workshop that works for you!